Today in Israel we observe 'Yom Hazikaron'- 'Israeli Memorial Day', the day of remembrance for the fallen soldiers of Israel and the victims of terror. We couldn't think of a better day to share this beautiful letter of appreciation, inspired by Michael Levin's life. Michael was an American soldier in the Paratroopers Brigade of the Israel Defense Forces who was killed in action in the Second Lebanon War, during the first round of fighting in the Lebanese town of Ayta ash-Shab. He was 22 years old. He was a Lone soldier, after having made Aliyah from Philadelphia in 2002. "I'm sure you get emails like this all the time, but I just wanted to thank Mayanot for the actual life changing experience that I had on my Mayanot 190 bus (summer 2014). The trip was so incredible that I had extended to stay for two more months. Those two months led to almost five months that now led me to make Aliyah. My staff leaders, became like my family and continued to look after me during my extension. Also, the story of Michael Levin that was shared with us influenced me to such an extreme that I volunteered at the Lone Soldier Center in Jerusalem during my extension and even became an intern. I was blessed to meet Michael's parents and had the opportunity to work daily with some of Michael's friends. I plan to attend IDC in the fall for my MBA and then start my life here in Israel. For the rest of my life when anyone asks me how I ended up moving to Israel the story will always start with Mayanot 190". 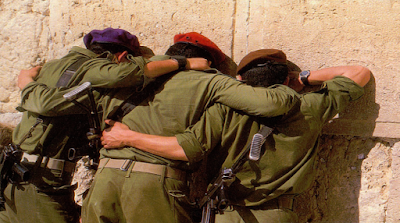 May the many men and women who serve in the Israel Defense Forces, protecting us with their lives, be remembered today. May they continue to inspire us to change our lives for the better, and may their courage and memory live on.